04 Swelling of body parts (called edema). The term Nephrotic Syndrome is coined from two words: Nephros (in Greek) meaning kidney and Syndrome denoting a group of symptoms. Nephrotic Syndrome is a set of symptoms related to kidney dysfunction, and not a disease, in and of itself. Nephrotic Syndrome is a disorder characterised by loss of proteins in the urine. In realism, Nephrotic Syndrome can be the first sign of various diseases that damage the kidneys, especially tiny blood-filtering units (glomeruli) in the kidneys, where urine is formed. This causes fall in the protein levels in the blood, and water to move into body tissues, causing swelling and bloating of body (edema/Oedema). To know what is Nephrotic Syndrome, let us first briefly understand the structure and function of the kidneys. The kidneys are two bean-shaped organs found in the lower back. They are about the size of a fist. The kidneys are like body’s filters, which remove impurities or wastes from the blood via the urine and return the cleaned blood back to the body. Each of these kidneys has millions of units to filter blood called glomeruli. Glomeruli are tiny blood vessels that form a meshwork in the kidney through which blood is strained to filter out excess water and waste products. 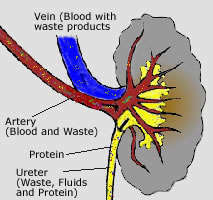 When the kidneys are working well, they clean the blood and get rid of waste products, excess salt, and water. 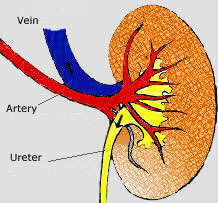 When diseased, the kidneys may get rid of things that the body needs to keep, such as proteins and blood cells. The normal architecture of the glomeruli prevents a majority of protein from getting filtered into the urine and this holds protein in the blood. Protein help the blood soak up water from tissues. But kidneys with damaged filters may let protein leak into the urine. As a result, not enough protein is left in the blood to soak up the water. The water then moves from the blood into body tissues, producing swelling. This swelling may be most noticeable around the eyes, legs, hands, belly, etc. Normally, a person loses less than 150 mg of protein in the urine in a 24-hour period. However, patient of Nephrotic Syndrome will loose more than 3.5 grams or more of protein during a 24-hour period, or 25 times the normal amount. As body looses this vital protein in the urine, this results in drop of protein in the blood called hypoproteinemia or hypoalbuminemia, another cardinal feature of Nephrotic Syndrome. Hypercholesterolemia (high blood cholesterol) is common in Nephrotic Syndrome. In addition to albumin, other important enzymes involved in cholesterol metabolism, slip through the glomeruli, which contribute to high blood cholesterol. About two in every 10,000 people experience Nephrotic Syndrome. Nephrotic Syndrome can affect children and adults of any age. In children it is more frequently encountered between 2-5 years of age. The disease is more common in males than their female counterparts. The condition tends to be more common in families with a history of allergies. This notorious condition becomes more distressing because of its chronic nature and tendency for frequent relapse and recurrence. d. It can help in reducing the dependency on cortisone and cyclosporine. Homeopathic treatment is very strongly suggested in various stages of Nephrotic Syndrome.